For me the benchmark for XPath tools is the FirePath for Firefox, which fits IMHO perfectly the needs of testautomation. The XPath Helper is the most distributed extension with 250 feedbacks, so I installed this tool first. After you press ctrl+shift+x, the tool appears on the TOP of the viewport, which is unusual for me, but ok. Very nice is the handling, to get the xPath for an element: you just have to press shift, while hovering over the element. Also an invalid xPath is alerted well. But the suggested xpath is much too long, so must be modified by hand in every single case. Additionally I’m heavily missing the virtualisation of the DOM, like in FirePath. While playing around, I quickly found a severe bug: This xPath „//*[@class=’gsfi‘]“ shows a match for this element: class=“gsfi xh-highlight“. Evil. 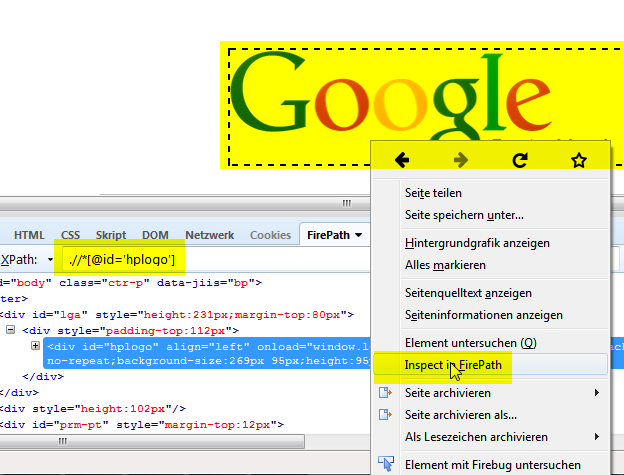 Summarized the XPath helper is no alternative to FirePath in Firefox. The second choice with 96 feedbacks is „XPath“, which comes with the unattractive total rating of 2 of 5 stars, but let’s see. After installing it, it opens two tabs just for advertisement, which is not really sympatic, but let’s see. As claimed I clicked on the toolbar icon and then clicked an element. I did it very often, but nothing happens. To check if I’m too dumb to use it correctly, I read the ratings in the Chrome Webstore: many users facing the same simple problem: this tool just doesn’t work. The third choice with tiny 10 feedbacks is xPath Analyzer, but let’s give underdogs a chance. After installing I found, this tool also comes with an icon in the toolbar. Trying to use it on www.google.com I got an error: „This page does not contain an XML document.“ Not wasting much of my time, I estimate: this tool has no use for testautomation. Last chance to find an alternative to firebug in Chrome is asking stackoverflow: In this answer it’s indicated, that for Chrome the best choice is to use the build-in Chrome Developer Tools to cope with xPaths. First you have to „inspect the element“ via context menu. This tool was updated in 2011 and since then it stays on version 0.2. I doubt, that this tool is developed further anymore. While testing I found a big bug: I could only find the element with XPath, when the element was in the viewport. This tool doesn’t show the DOM and has no syntax-checker. Also there was no update since 3 years. I have no hope, that it’s still actively developed. There’s no such thing like FireBug in Chrome ecosystem. 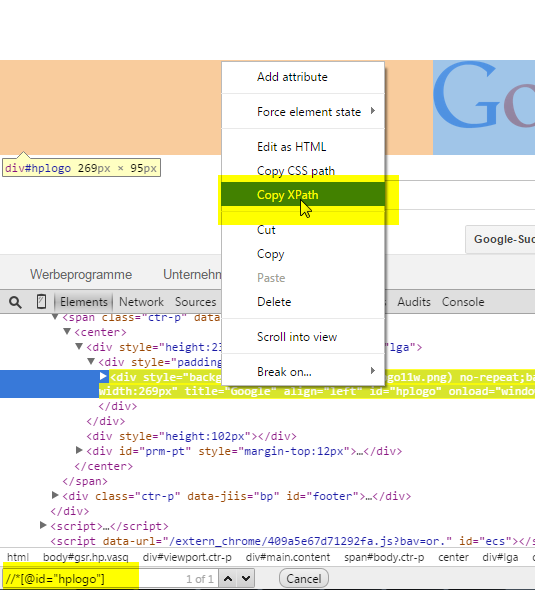 However if you must use a xpath tool in Chrome use the build-in Chrome Developer Tools. If you want to develop a proper XPath Tool for Chrome, please join in an existing project and don’t create your own. Don’t waist your valuable programming ressources. there’s also some other related tips for finding and testing CSS selectors and XPath as well, across browsers. My experience is, that whatever tool you choose you always have to customize the results. Think about dynamic IDs, siblings, etc. though that problem is browser-independant. sure with dynamic IDs, you have to customize the xPaths. But there are Webpages with useful IDs, like the Goolge example in this blog post. I think my requirement: „suggesting a proper xpath for an element“ could be fulfilled by a xpath tool for more webpages, if there would be a bigger effort in developping those xpath tools. That’s a good point Felix. To me a good XPath tool is one that allows you to tweak the XPath and re-evaluate/test it, together with a DOM viewer and default XPath generator to complement the tester/evaluator functionality. Such is FirePath, and sort of Firefinder.